12,000+ delivery record in Japan only. of the paper cutting machine. Dreams of the future are our power source ! of business experience since it started business, keeps adding new clients. technical innovation under the mission of contribution to the people and society. to play an important role on the customer’ s side with truly valuable sophisticated functions. Our goal is to develop cutting-edge technology that can arouse surprise and excitement. ITOTEC keeps developing the new way with a searching mind and enthusiasm. Joichi Ito, the first president, started production and marketing of various binding machines, most of which were paper cutting machines, in Nagoya. A new factory was built in Nakamura-ku, Nagoya, and started operation. Almost all buildings and equipment were burned and lost in the Nagoya air raid. The factory almost lost in the war disaster was reconstructed and operation was restarted. 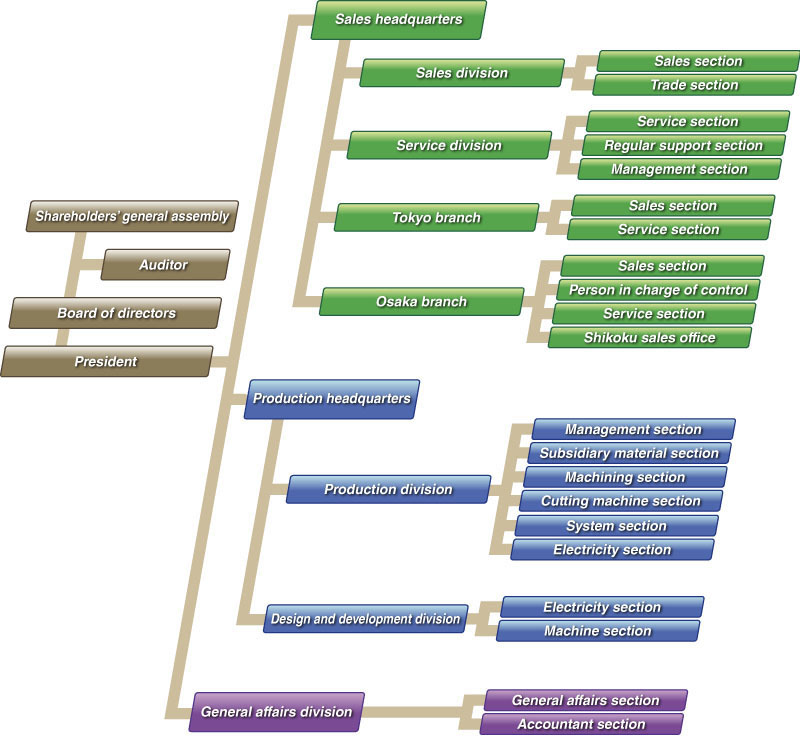 Organization was changed to Ito Iron Works, Ltd. with a capital of 500,000 yen. The spring clamp type ZM cutting machine was released. Type ZY hydraulic high-speed cutting machine was released. The magnetic tape storage type cutting machine was released. A small cutting machine, type SP22 cutting machine, was released. Tokyo Sales Office opened. A four-story headquarters building was built in Nakamura-ku, Nagoya. The Shikatsu factory was moved as an assembly and test operation factory. Cutting machine ZDNC-I equipped with an NC unit was released first in the world. The model replaced earlier magnetic tape types and served as a prototype of the current computer-equipped cutting machines. The capital was increased to 100 million yen. Inuyama factory was built in current Inuyama City and started operation as an assembly and test operation factory. Computer-equipped cutting machine MNC-2 was released. Computer-equipped cutting machine MNC-3 was released. It was exhibited at IPEX Exhibition held in Birmingham, England. The headquarters and all factories were integrated in the current site. Participated in DRUPA, the largest printing and binding exhibition in the world held in Dusseldorf, West Germany. Paper discharge stacker was released. FC type cutting machine was released. Computer-equipped three-way cutting machine FCT was released first in the world. ITOTEC CO., LTD. became the new company name through corporate identification (CI) activities. The automatic paper feed/discharge system was exhibited in the IGAS Exhibition held in Tokyo. The capital was increased to 200 million yen and a new six-story building was built at the current address. Itotec has opened its official web site. Packaged periodic inspection service “Regular Support Service” was started. Takamatsu Sales Office was installed in Shikokuchuo as a Shikoku district sales office. eRC Series equipped with a color LCD touch panel was released. An L-shaped layout paper feeding system “RSL3.1” was released in IGAS2007. Software for analyzing CIP4/JDF data and converting it into paper cutting data, “CIP4 Pack,” was developed. Our 10000th paper cutting machine was delivered. Cutting Machine.com was opened as a site for applications in various industries.